The Enns river is more or less known to everyone in Austria. The longest inland river, the large, powerful tributary of the Donau and one of the most beautiful waters in the country. Yet the fact that the Enns has its source in Flachauwinkl in SalzburgerLand, as a small stream in the mountains, further downstream providing the whole resort with highest-quality water, before then flowing towards the big river through 3 provinces, that’s only know by a few. A shame really. Reason enough for me to jump on my electric bike and ride to the very start of the Enns Cycle Path and to follow this wonderful cycle route as far as Radstadt. What did I experience along the way? Wonderful resorts with genuinely friendly people, water – sometimes quiet, sometimes bubbling and always top quality plus a day I shan’t forget in a hurry. Let’s go! It’s hard to believe at this point that this small, idyllic mountain stream burbling through the forest will become a proud river. And yet further downstream the Enns becomes the longest inland river in Austria, curving its way through three provinces through the mountains, before finally joining up with the Donau, the vast and noble river in Austria. No sign of that here though, thank goodness, and the big, wide world is at most just a notion and far, far away. I really fancy a leisurely bike tour. 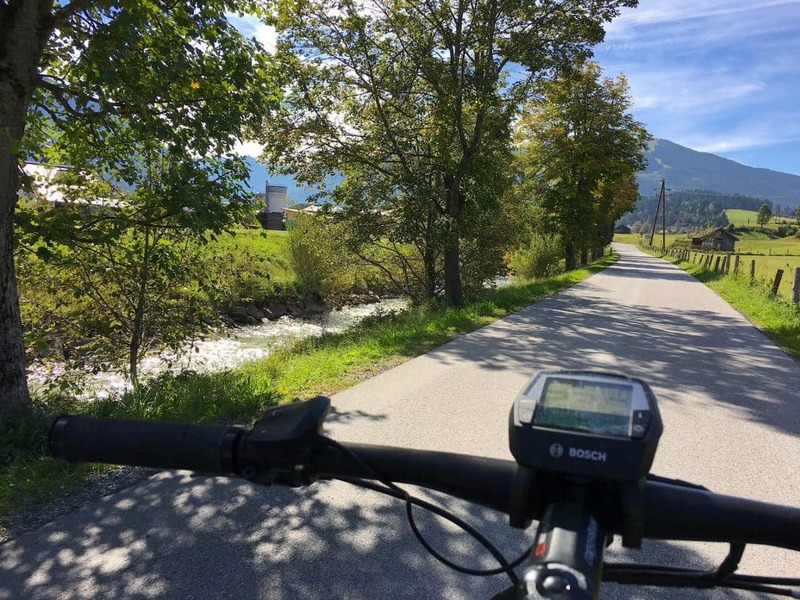 Pedalling through the countryside of the Salzburger Sportwelt and maybe testing an e-bike for a change. 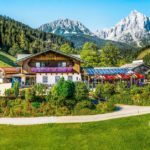 What could be better on such a lovely summer’s day than exploring the source of the Enns, then gliding alongside the Enns river on the Enns Cycle Path, visiting the picturesque resorts of Flachau and Altenmarkt and finally enjoying a well-earned, if somewhat late lunch in Radstadt. On this particular day I start off in Flachau, where I’m already expected and my reserved e-bike is waiting for me. Everywhere throughout the region you’ll find this type of bike for rental and the network of charging stations ticks all the boxes. At this point I would like to dispel the opinion that e-bikes are not for real bikers. E-bikes are for everyone, and anyone who has once sat in the saddle of this state-of-the-art piece of sports equipment, knows exactly what I mean. You can conquer the peaks of the most far-flung mountain and touring e-bikes are also suitable for being active and getting fit. The best thing is, that everyone can individually adjust the level of electric power required. But I’m digressing, here and now it’s all about the Enns river and the wonderful Enns Cycle Path. Just to reiterate – e-biking is really great, makes you feel good in the saddle and everyone should at least give it a go, bike sports enthusiast or not. Over and out. 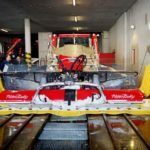 So I head off first of all from Flachau to Flachauwinkl, even though the actual destination of my tour lies in the opposite direction, in Radstadt. However, before I ride in that direction, I want to visit the source of the Enns river and see where the people from Flachau get their fabulous drinking water from. Here the cycle path here winds idyllically through the scenic valley countryside, I’m cycling along a really well made trail through refreshingly cool forests, over lush meadows and time and again leave picturesque resorts behind me. The Enns is as good as always alongside and on more than one occasion I get off my bike to go down to the river, to look at the beauty of these waters close up. Leaves, swirling along the rapids, colourful butterflies rest for a short time on my arm, and colourful blooms which gently sway back and forth in the wind. You could get really whimsical here. In Flachauwinkl, where in winter the skiers ride up the mountains on lifts to the legendary pistes, I finally reach the first stop of my tour. Even though the source of the Enns is somewhat higher up, you can still see it. This is the km 0 point, the start of the Enns Cycle Path. From here on the path follows the Enns river to the town of Enns on the Donau, some 240 km away in Upper Austria. 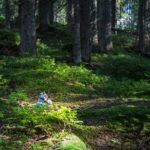 Even though it is theoretically possible to do the whole trail in 2-3 days, you should really take a week, to see and take in everything along the way. I get off my bike now and let the beauty of this sport work its magic on me. 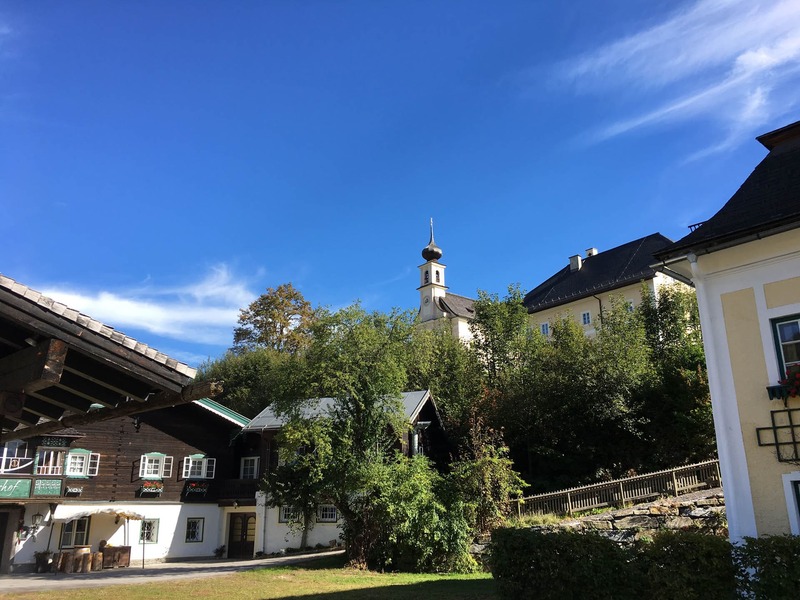 So this is where it come from, the wonderful drinking water from Flachau, here, where the three little streams – Marbach, Flachau and finally the Enns join together to create a proper river. 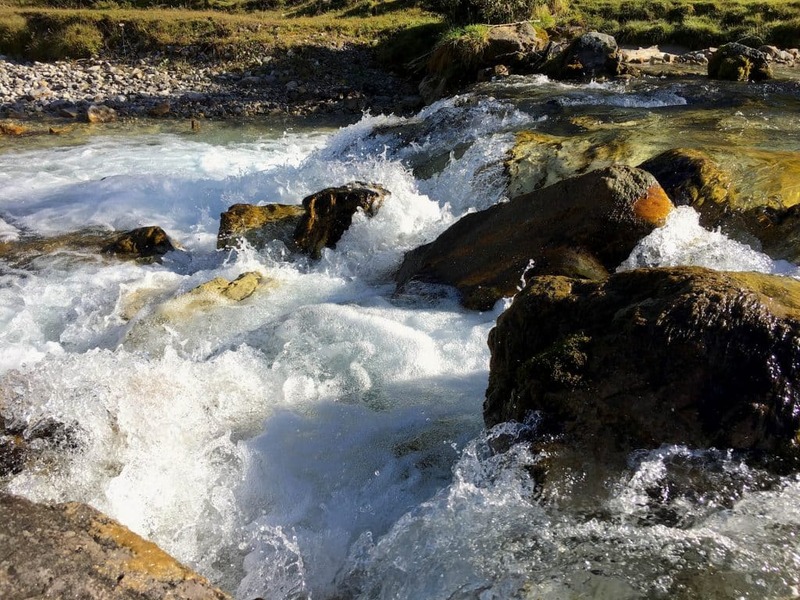 To be more exact the source of the Marbach stream, where the water from the depths of the surrounding mountains run together it emerges as wonderfully tasting fluid. These mountains consist mainly of lime and dolomite marble. Limestone, which under pressure and temperature conditions has been transformed into metamorphic rock as part of the upfolding of the Alps. High up in the mountains the rainwater seeps through and is filtered in the narrow crevices, clefts and caves of the stone layers and led underground onto a permeable mountain base made of slate and sandstone. Unbelievable how far water has to travel before it spurts as tap water into our houses. We really should think more often about how lucky we are to be able to enjoy such pure water every single day. Whilst I muse away, I really savour the next sip of my freshly-filled water bottle. 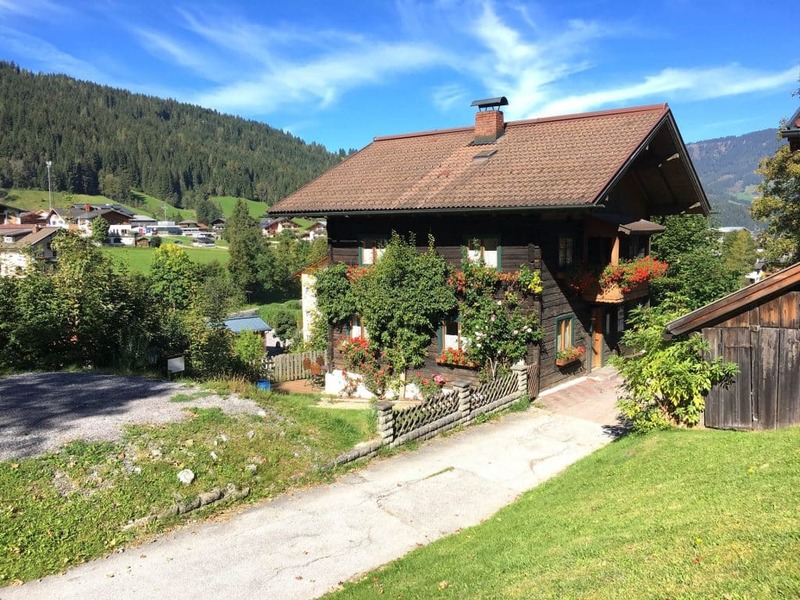 The high purity of the water here, by the way, also comes from the fact that the whole seepage surface is exclusively used for alpine agriculture and therefore no contamination can occur. The source and water is permanently under the strict protection of the Salzburg provincial government. Now it time for me to slowly head off again, if I want to reach my destination of Radstadt today. The battery of my e-bike shows a sporting 75% charge level. More than enough and I’m back gliding along the Enns Cycle Path. This time, however, in the other direction. In the meantime the sun is high up in the sky, beaming down onto the curly waves of the Enns and sparkling back at me thousandfold. What a spectacle, what a great day! The cycle path is well signposted and you can easily find your way through the various resorts along the way. After a good half an hour Flachau lies behind me and Altenmarkt is just a few kilometres in front of me. 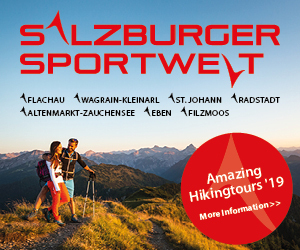 In winter both resorts are part of the Salzburger Sportwelt and thus to the absolute top destinations with regards to skiing and winter sports. Yet in summer too, sports enthusiasts of all types can find ideal terrain for pursuing their passions. The region is above all a real paradise for bikers and cyclists. It doesn’t matter whether you fancy a gentle tour, or whizzing on your racing bike through the valleys and up the mountain or want to be cheered on to high performances by spectators at one of the top events – here absolutely everyone will find the conditions and pre-requisites for what they fancy. For me the Enns Cycle Path is just perfect for today. I cycle over wide open fields, see the paragliders above me playing in the wind, stop in Altenmarkt for a short chat with a cyclist going in the other directions and don’t let myself get stressed. As Radstadt, true to its name (literally translated – bike town), with its historic town centre comes into view, my stomach also starts to rumble. How I’m looking forward to a tasty lunch. Driven by curiosity – these words describe me perfectly. Whether on a sailing boot, in deep snow, out and about in the city or in the country, or on one of my many travels – I’m constantly on the search for something new, something special, I’ll try anything and I love talking about things and reporting about them. The Kaserboden: Come and dance with the elves and fairies – You’ll be rewarded with energy and joy!